‘Passing’ is a common euphemism for the death of a person, as he or she is said to ‘pass away’ or ‘pass on’. This open-ended saying has at its heart a notion of transformation from one state to another, which in turn grants the possibility of grasping or approximating the passage of time and the materiality of death and decay. This book begins with the idea that since all material things - whether animals, human beings, objects or buildings - undergo some form of passing, then the specific transformation in these passages and the materiality actively given to it can offer us a grasp of otherwise precarious temporalities. It examines how human beings strive to relate to the temporal dimension of death and decay, by giving new shape and direction to being and by examining its natural transformations. 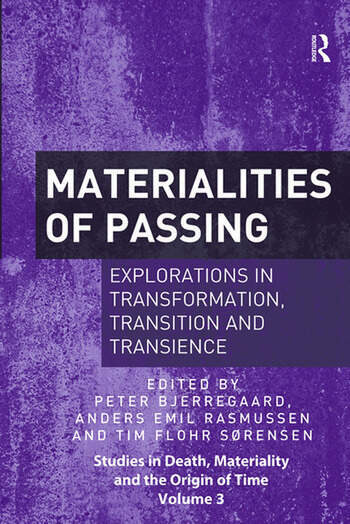 Focusing on the materiality of passing, and thereby the relationship between embodiment, temporality and death, Materialities of Passing offers rich case studies from Europe, Papua New Guinea, South Africa and the Russian Far East for exploring the material, spatial and directional aspects of the very interface between life and death. As such, it will appeal to scholars of anthropology, death studies, archaeology, philosophy and cultural studies. Peter Bjerregaard is senior adviser of exhibitions at Museum of Cultural History at the University of Oslo, Norway. Anders Emil Rasmussen is a curator at the Vejle Museums, Denmark. Tim Flohr SÃ¸rensen is Assistant Professor of Archaeology at the Saxo Institute at the University of Copenhagen, Denmark.